The Bears Are Around - Like Phantoms. There are those stalwart souls that proclaim to have grown accustomed to having bear in their backyard. Many of the Alaska stories by the old guard sourdoughs, intrepid explorers and writers who try to fake us out with their bravery, tell us about living amongst the bears like they were pets. Let me tell you, friends, I am not one of those. Every year when the fall is approaching and the raspberries are ripening and the fish are running in the river in front of us, I begin to notice a change in the landscape, not just the golden flecks that are creeping on the leaves, but when I go out in the yard every morning, I notice a new trail through the grass that surrounds our oasis in the jungle. And the trails are from the bruins that have emerged from nowhere to traversing the landscape up and down this river in search of sustenance for the onslaught of winter. It doesn't get much better than this. 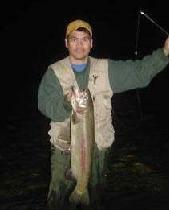 An unidentified angler landed this rainbow at Cooper Landing. My guess is about 7 pounds. 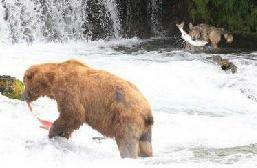 The Brooks River is famous for the pictures of bear fishing in the falls. This recent picture shows that the wolves are learning by watching and are becoming accomplished fisherwolves. Veggies Are the Star Attraction at the State Fair. Alaska is no different from other state fairs when it comes to agriculture and animal husbandry competition. Our state, however, seems to have a lot of world records when it comes to veggies. This is attributed primarily to the long daylight of our summers and also, no doubt, some serious fussing and fertilizing. Here are the current records, some of which were set this year, because of a relatively dry summer, allowing the giants to mature without splitting or developing cracks. 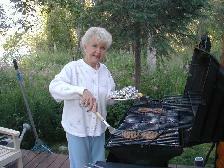 Linda's sister Kay (Chisholm) returned again for a repeat fishing experience for Sockeye. She arrived to a rainy period that she greeted with enthusiasm since Fresno was baking in 120 degrees.